Last week I came home to my brother’s apartment from a really, cost really long day of meetings. It was late, oncology I had an early morning run planned and I didn’t feel like going out. So we did what NYers do best. We got delivery from a local pita place. I wasn’t expecting much from my brown rice bowl, but I devoured it. 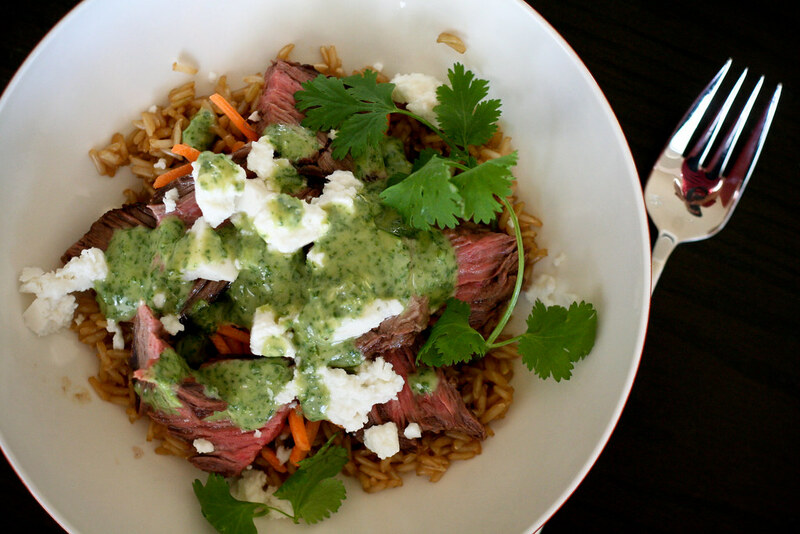 Brown rice, steak and feta, vegetables and golden raisins. It was healthy and filling and interesting. Exactly what I needed to end my long day and fuel my morning workout. So of course I came home and recreated it. I know there was some kind of green sauce on the side, but I couldn’t remember what it was supposed to be. I improvised and made a tangy Tahini and Cilantro dressing which complimented the earthy brown rice and sweet golden raisins. This is one of those dishes where you think – do these things really go together? Let me assure you that they do. It’s one magical bowl of goodness. Bring the stock to a boil in a small pot, then add the rice. Once it comes to a simmer, reduce the heat to low and cover. Cook undisturbed for 35 minutes, or until the rice is tender. Alternately, cook the rice in the stock in a rice cooker. While the rice is cooking, make the dressing by either blending the dressing ingredients in a blender or food processor or whisking the ingredients together (chop the cilantro as thinly as possible before you whisk). Set aside. Sprinkle your steak with salt and grill it until desired doneness (medium rare, please). I used my grill pan, but a real grill works just as well. After it’s done, let it rest for about 5 minutes, then cut into thin slices. 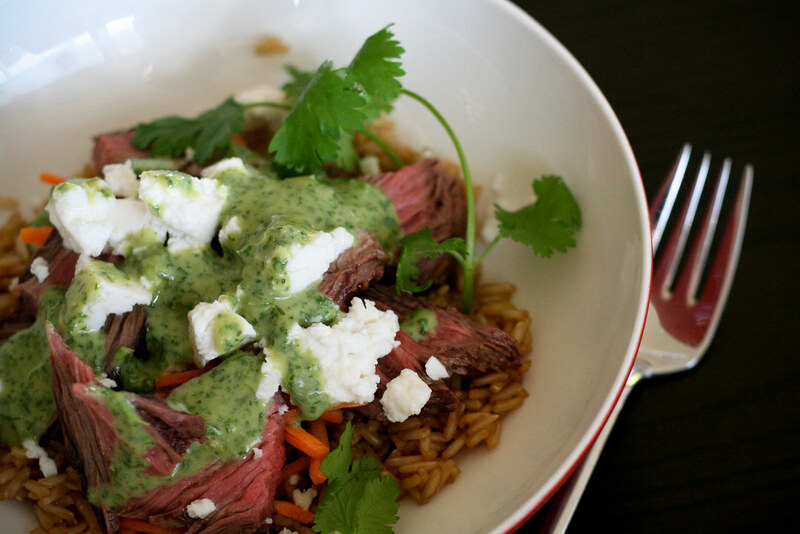 Serve the rice into 4 bowls and top with the carrots, green onions, golden raisins, feta and steak. Drizzle with dressing and serve. I have to say, I’m thoroughly enamored with that tahini cilantro sauce (I have a serious cilantro obsession). Do you have any idea what the name of the pita place was? Or where it was located? I obviously need to try this dish. Hi Joanne – I think the place was called Pita Grill on the Upper East Side. Portions are huge! The falafel was also decent. Thanks… this will be dinner tonight. Yum! I just made this for dinner tonight and it was unreal!!! The dressing on top totally makes it! My husband loved it too! ~ Thank you !!! Wow, I was looking for something completely different to serve for dinner tonight and I just found it. Looks like a great recipe! I just stumbled across your blog and you have instantaneously become my new favorite! i had brown rice and steak on the menu for tomorrow anyways, now i have a way to seriously jazz it up. thanks! Sounds great. How would this be with salmon instead of steak? Karen – I think salmon would work well. Let me know how it turns out if you try it!! Youre therefore neat! I won’t suppose Ive study anything at all similar to this just before. So great to seek out any individual by incorporating first thoughts about this subject. realy many thanks to get outset this kind of up. this specific web-site is a thing that is certainly sought online, a person with only a little bit originality. handy job intended for delivering something new to your web!